Halloween has become the ‘holiday’ where we have decided sugar and candy can be eaten in mass amounts. In fact, 600 million pounds of candy are sold during Halloween every year. Each household averages $44 spent on candy. While we’ve never advocated for a sugar free holiday, we do realize that as parents, you can at least offer healthier food under your roof. Between Trick-or-Treating, school parties, neighborhood trunk-or-treating, and community events, the kids will not be suffering from candy deprivation. 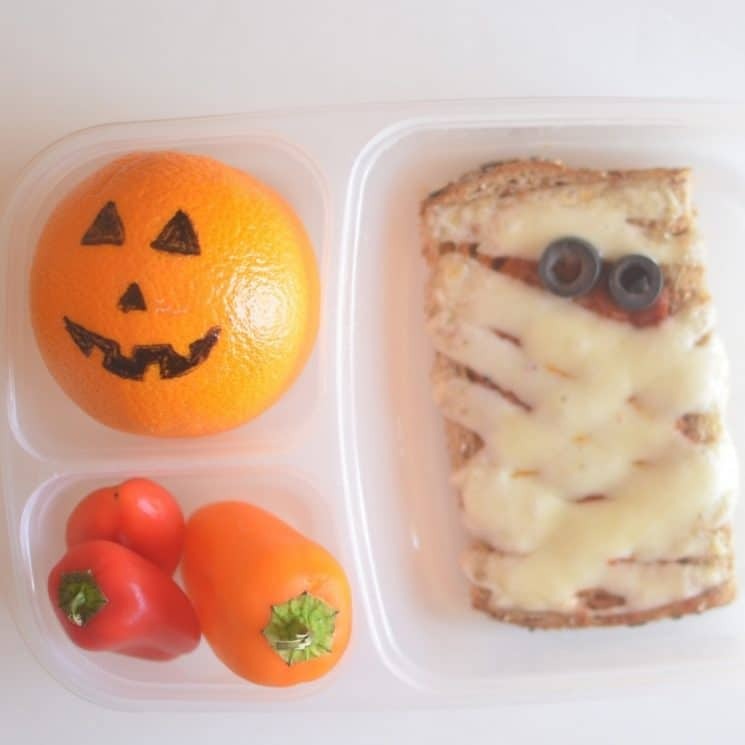 It’s so good for the kids to have healthy options at home, while still having a little fun with the holiday! 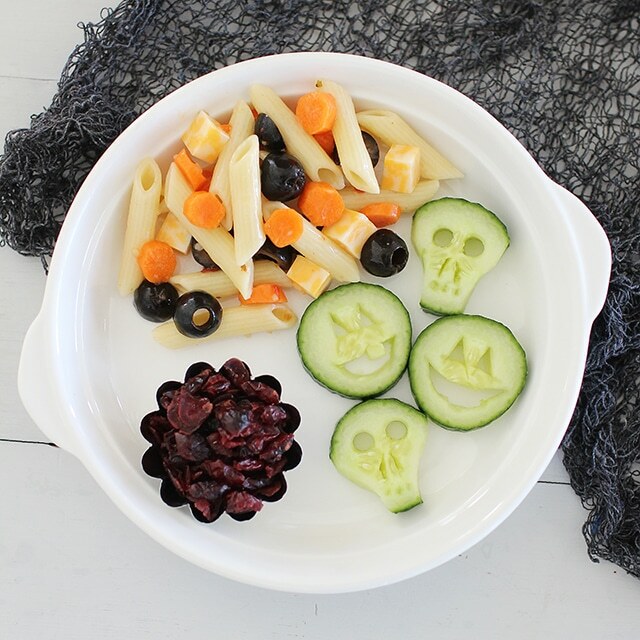 I love this idea for Halloween food, because it’s a quick snack, we always have the ingredients, and the kids love to make their own. We started with Babybel cheese (the best price for this is at Costco, where you can buy a full bag of 20 for the same price regular grocery stores will sell a bag of 10!). First step: unwrap the cheese. Second step: affix 8 pretzel stick legs. Third step: Add eyes. This can be made from anything you have on hand. We’ve used chocolate chips, raisins, and candy eyes. The Cucumber Skull or Pumpkins! Slice a cucumber into rounds. Using the edge of a knife, cut out face shapes from the inside. 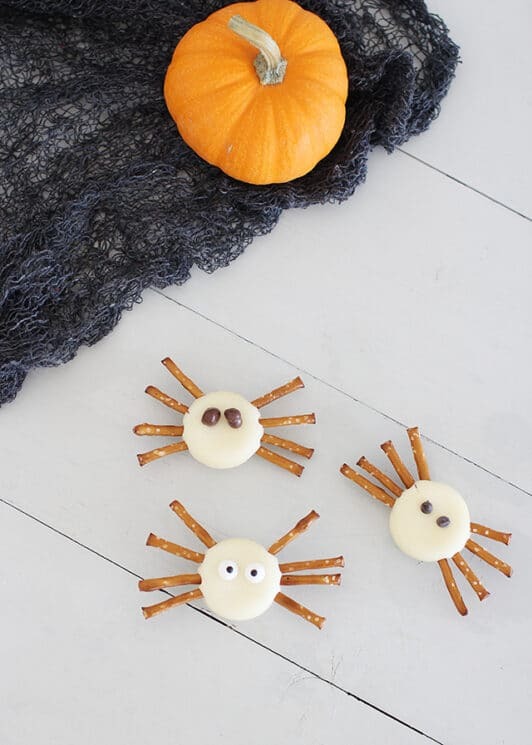 To make these spooky fingers, score a slice of string cheese with a knife. 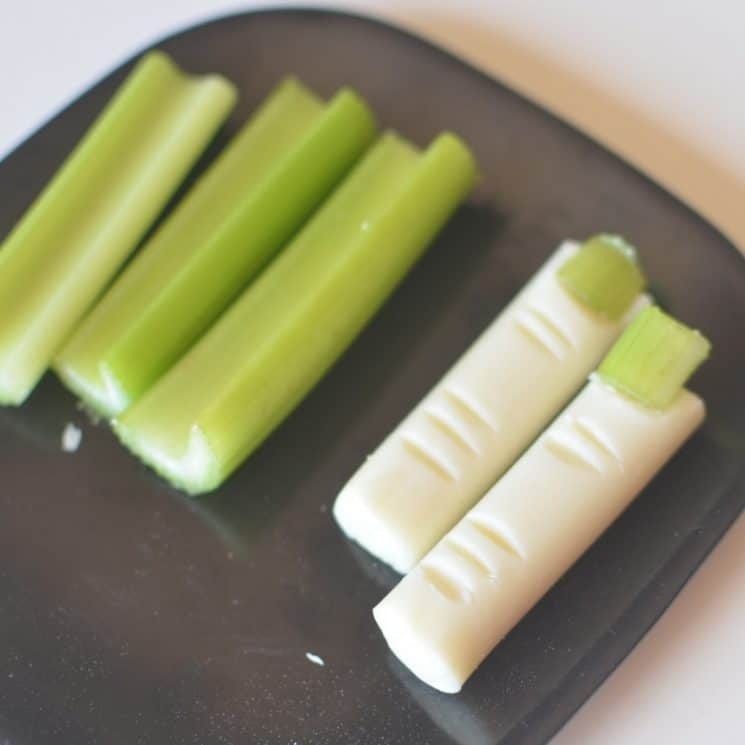 Using a small chunk of celery, place it on top to resemble a finger nail. Cut a circle out of your bread. 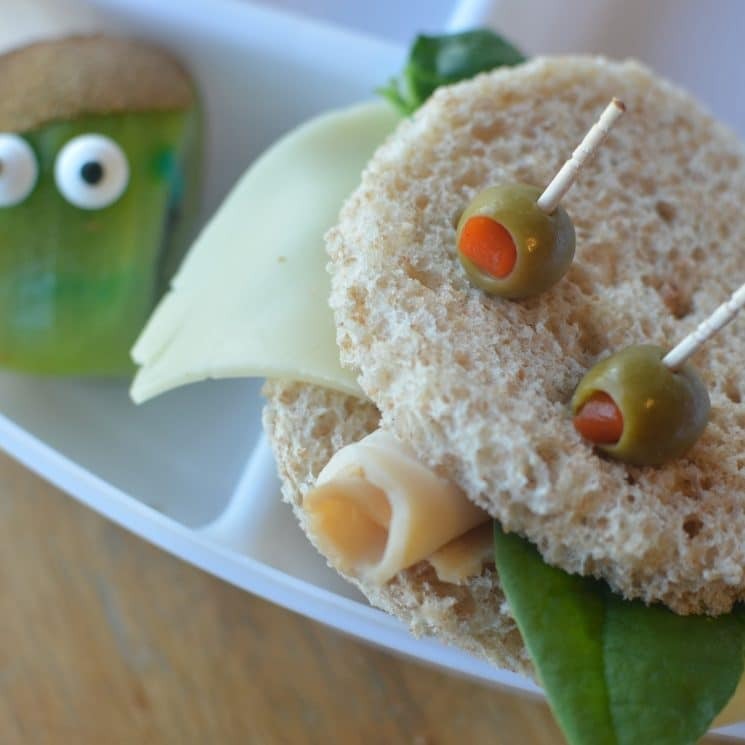 Overlay the sandwich insides like cheese to resemble fangs. Skewer olives to the top for the eyes. Roll up cheese or deli meat for the mouth. 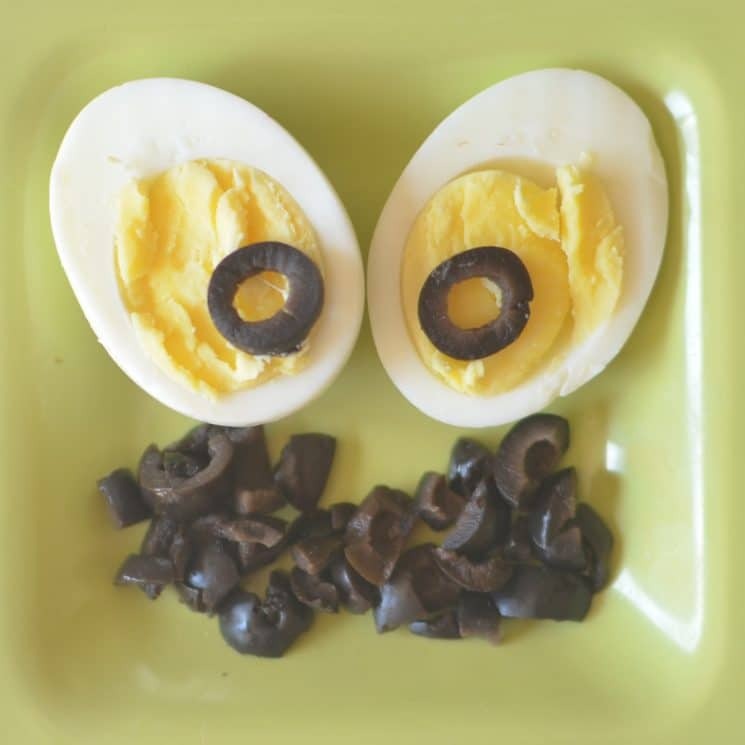 Using two halves of a hard boiled egg, add a slice of olive to the top for the eyeballs! Slice carrots into long finger like sticks. Bake or eat raw! I added creamy peanut butter to a piping bag for this. I sliced a banana and stuck the end in a popsicle stick. 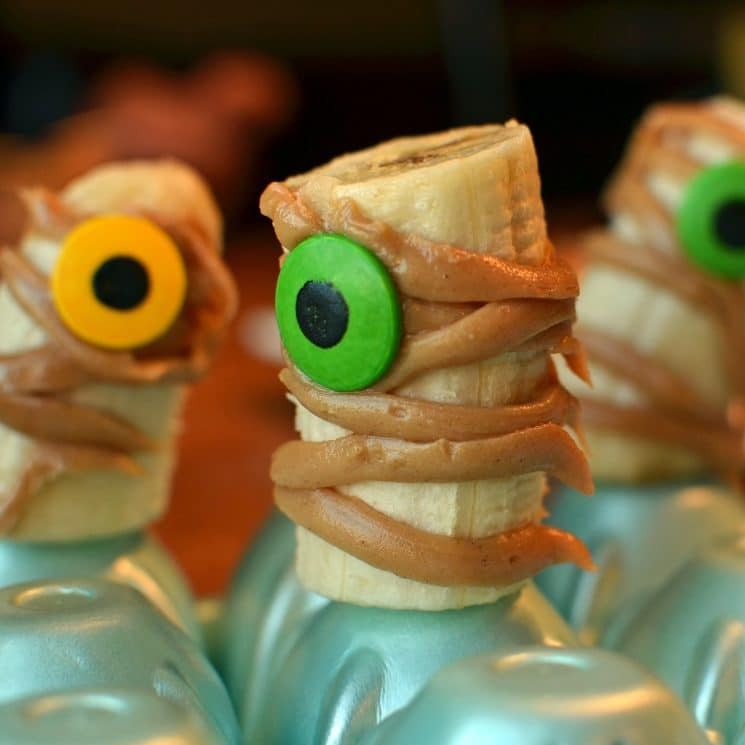 Then drizzled the peanut butter around the mummy (much easier if the banana is slightly frozen). 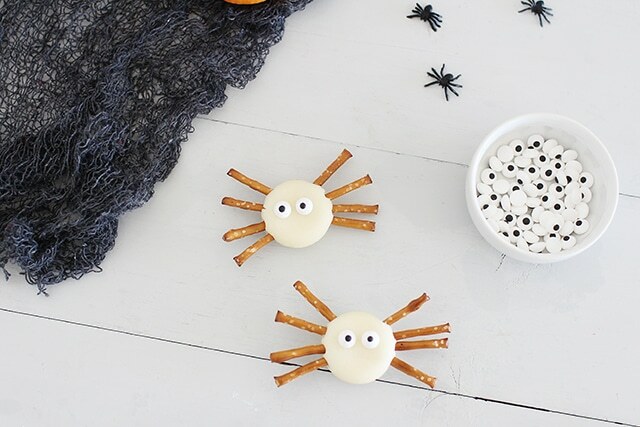 Add a large candy eye to make it look like a mummy. 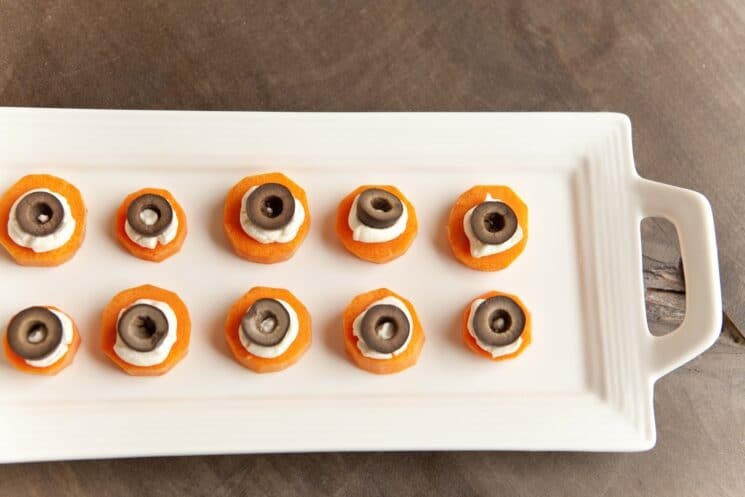 Slice carrots into circles or coins and top with cream cheese, sour cream, or yogurt and an olive slice. Using strips of mozzarella cheese, you can layer them across a piece of bread that has some tomato sauce spread on it. Then, bake for about 5-10 minutes, just until the cheese melts slightly. Slice apples into wedges. 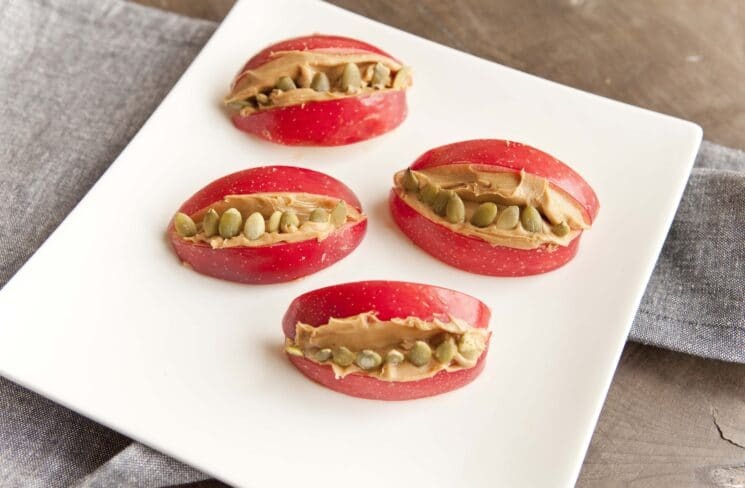 Spread the inside with peanut butter, and then arrange seeds like sunflower seeds or pumpkin seeds into a row of teeth. 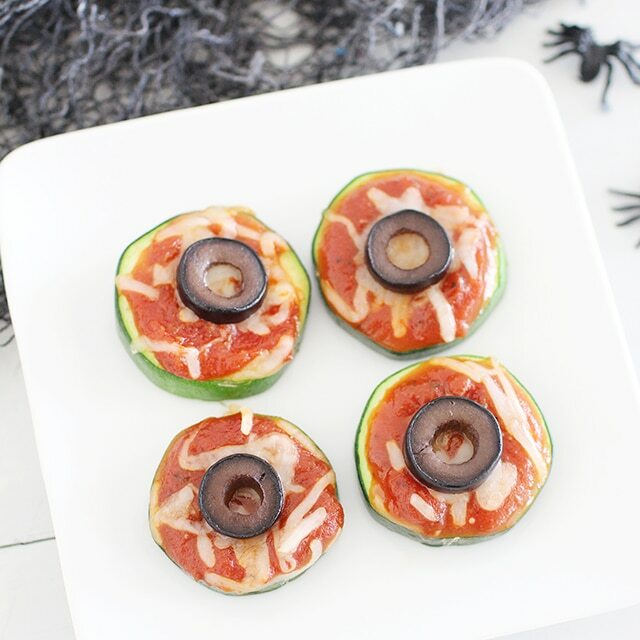 I love this idea for zucchini with pizza sauce, mozzarella and a slice of olive! It totally looks like an eyeball! 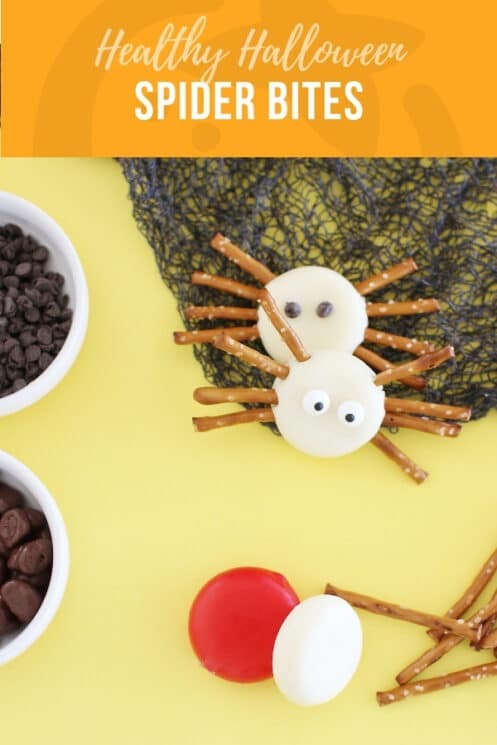 I love these ideas because they are simple enough for kids to make on their own. 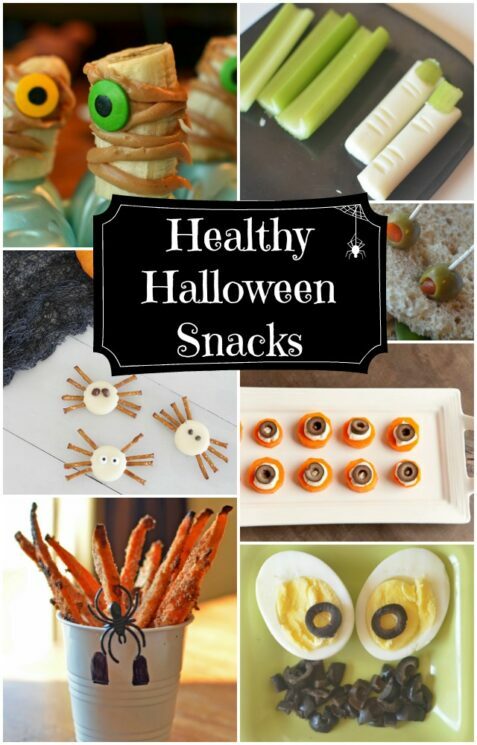 They are healthy enough that they can be a fun way to celebrate, without adding to the sugar load of the day. 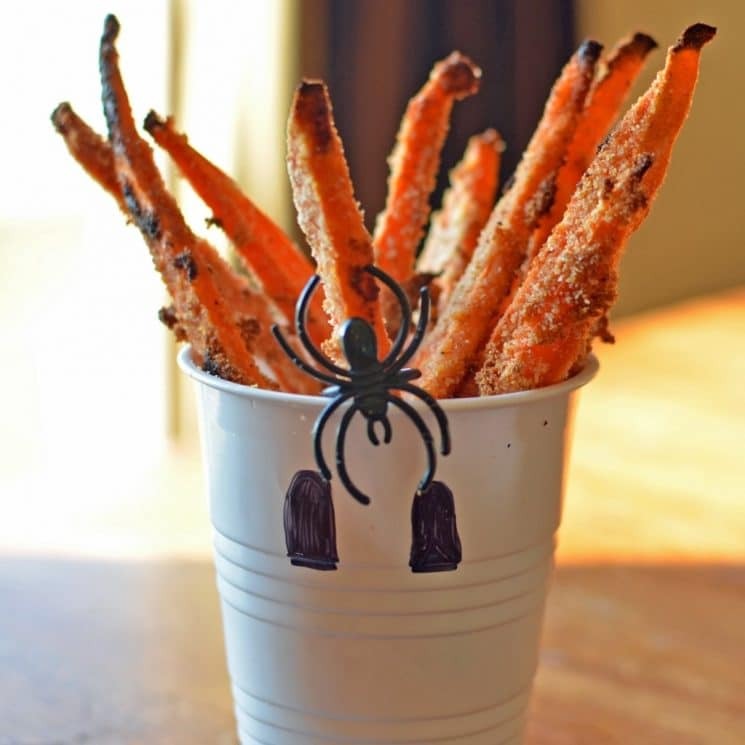 What other snacks do your kids like to make for Halloween festivities? Thanks for great idea. We had a great party.